Find the BMW 3 Series too small? Then you'd likely look at the 5 Series instead, right? Well, not in China. There the market has displayed a preference for long-wheelbase versions of smaller cars. And that's just what BMW is unveiling at the 2019 Shanghai Auto Show later this month. Built locally in Shenyang in collaboration with Chinese automaker Brilliance, the long-wheelbase 3 Series sedan is based on the new G20 generation we've already seen. Only it's longer. Just how much longer, BMW hasn't said. But the outgoing model was similarly extended by 4.3 inches. That'd leave the extended 3 Series just a few inches shorter than the standard 5 Series, even if the other dimensions remain the same. Like the stretched versions of the X1 and 5 Series (also produced locally for the Chinese market), the added length goes towards legroom for the rear-seat passengers, who'll also enjoy a panoramic glass roof. As with the exact exterior dimensions, powertrain specifications have yet to be disclosed, except to say that it'll be motivated by a turbocharged four-cylinder engine. BMW currently offers the standard-length 3 Series with a 2.0-liter turbo four rated in two states of tune. 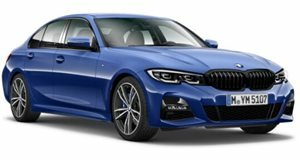 The 320i produces 181 horsepower and 221 lb-ft of torque, with the 330i packing 255 hp and 295 lb-ft. Whatever the engine, though, BMW will sell boatloads of 'em: a third of all 3 Series models end up in China, where 80 percent of customers opt for the extended version. BMW is also showcasing an extended-range X1 xDrive25Le plug-in hybrid at Auto Shanghai. The X3 M and X4 M are making their global auto-show debut. The 8 Series coupe and convertible are appearing in Asia for the first time, and the Vision iNEXT concept and iFE.18 electric racer will be on display as well.